GoodGym | Scoring a GoodGym Hat trick! Scoring a GoodGym Hat trick! Katie Carew-Robinson Trainer for GoodGym Portsmouth. I love running, living near the seaside and getting out into the great outdoors! I also like cake! Have your own GoodGym story to share with the community? Email getinvolved@goodgym.org and we'll be in touch. 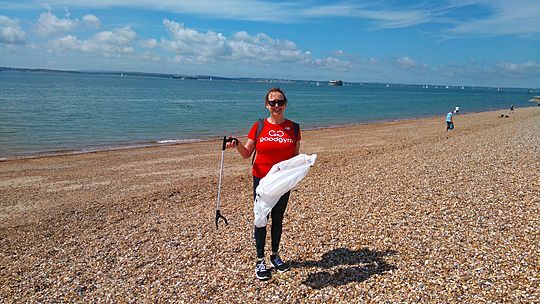 Mel is the first runner from GoodGym Portsmouth to have completed the hat trick of group runs, missions and coach runs. 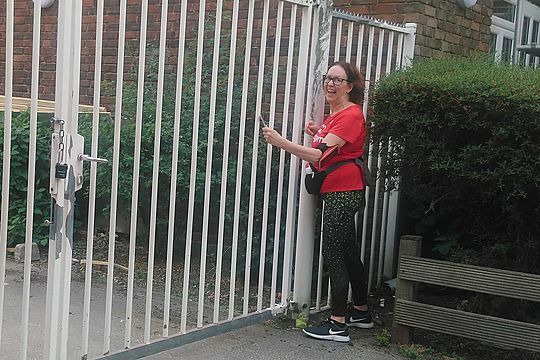 We caught up with her to find out what motivates her and how being involved with GoodGym has affected her life. How long have you been running for? I have run with GoodGym Portsmouth since its launch in May, and had only been doing some short runs including 3 slow Parkruns leading up to that. The running has really taken off since I started with GoodGym. What attracted you to join GoodGym? My dislike of running on my own! Running with GoodGym has given me a purpose to run, the feelgood factor and has meant that I enjoy it much more as a result. How have you found the group runs /tasks so far? Any stand-out moments? The Group Runs are great, because we run as a group. Lots of chatting, catching up with the week’s news. We also see different parts of Portsmouth with the different run routes which has helped me settle in Portsmouth. Stand-out moments are the responses from the people you are helping. They are always so pleased with how much and what we’ve achieved within the timeframe – I feel very lucky to be a part of it. What do you like about the coach runs? Any tips for runners who are interested in getting a coach? The Coach run makes sure I get out on a 2nd run within the week and enables me to share some time with someone who is interesting, has lots of stories and wisdom to share and looks forward to our chats. As time has gone on, I’m enjoying the visits more and more myself, with the challenge of finding new and different things to talk about. I can certainly recommend the coach runs to anyone considering doing it. My main concern was that I might let them down with too many cancellations due to work commitments, but in fact, it’s entirely possible to change the night you visit if you can’t make it on the fixed night, and with notice your Coach absolutely understands this might happen. I’m enjoying the visits more and more"
You will have an interview with a GoodGym HQ and you decide up front the day, time, gender etc. of the coach you’d like to visit – GoodGym will then match you to your feedback. I gave this a lot of thought up front and picked a day and time that was less likely to be impacted by anything. What did you enjoy about the mission? Will you do more? 15 years worth of stuff"
I loved doing the Mission. I experienced a different run route, so getting to know the area better. 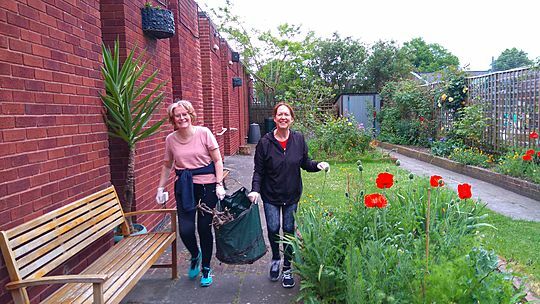 Less people did mean that we didn’t manage to do quite as much as we hoped to (the lady had asked for her garage to be cleared but when we got there we found it was packed full with 15 years worth of stuff!) However, the lady we helped was delighted with progress to-date. I will definitely do more and it beats just sitting at home watching the TV if you didn’t have anything else planned! What's your favourite thing about GoodGym? Definitely the people and making new friends. The running comes a close second because of what I can now achieve in terms of distance and stamina. There are many running clubs around, but combining the running with the doing good has made all the difference to me. coffee afterwards is an added bonus"
The support from all the runners, the ‘never leaving anyone behind’, the encouragement when you think you are never going to make it back to base has been wonderful. 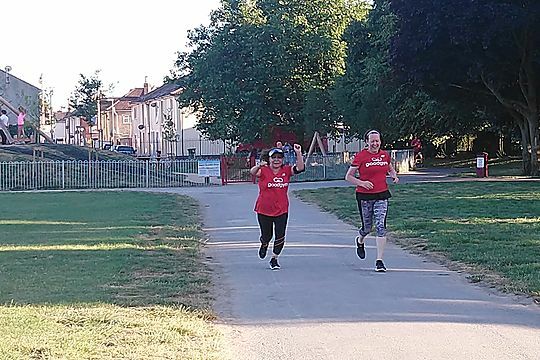 The extra activities, like meeting up at the Southsea Parkrun with coffee afterwards is an added bonus, the Indian street food after one of the runs when England were playing in the World Cup, the picnic at the Hilsea Lido after our mission with optional swim before going home. Sampling some delicious home cooking. All of this adds to the enjoyment of being part of the GoodGym group. What would you say to someone who is thinking of coming along to a GoodGym run? Just do it! For all the reasons above and if you have any doubts about being able to run any distance (as I did), then GoodGym will prove that you definitely can, you’ll continue to improve and most importantly you’ll get that feel-good factor that helping others always gives you, plus having a lot of fun whilst doing it! With GoodGym you can choose whether you just do the Group Runs, or add in some other options, like Coaching, Missions, Task Force. The website gives details on what all of these entail, with no commitment. However, having chosen to totally immerse myself in all areas, the rewards are 10-fold. I’ve grown in confidence not just with the running but generally, and even signed up for a running holiday in Spain next April, details of which came via my GoodGym friends. I have expanded my friendship circle and it feels very good!